I am listening to a lot of tango music recently and I would like to share some findings. Few weeks ago I stumbled upon Adios Nonino record of Salvatore Accardo with Orchestra da Camera Italiana made by Fonè Records that ignited my interest into this genre. I mean I’ve listened to compositions by Astor Piazzolla before but it was never exclusively and with such a pleasure and understanding as these days. But this work as expression of composers profound sadness caused by the passing of his father is special and is likely to move you to tears. It is a record of a wide-range dynamics that captures the instrument’s texture and timbre along with the venue itself, but also the strong emotions Piazzolla brings to the compositions. Once ignited the interest in Astor Piazzolla and his tango nuevo urged me to search after other records of his music. 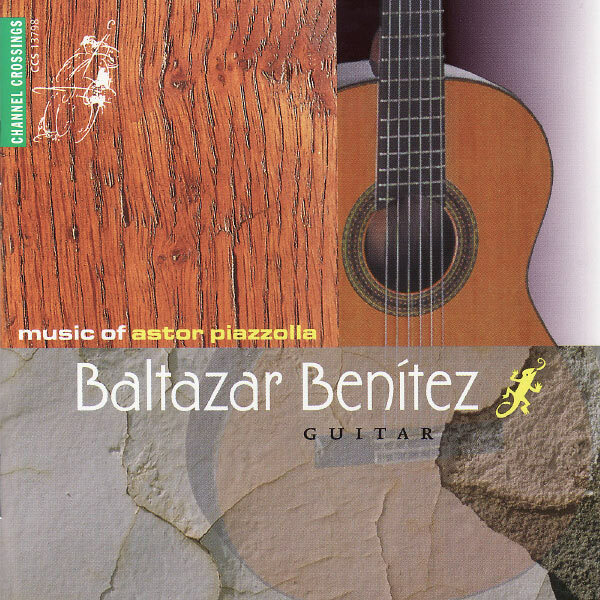 That’s how I discovered Music of Astor Piazzolla – a record of the talented guitarist Baltazar Benitez. Recorded in 1984 the album consists of works exclusively composed by Astor Piazzolla. Besides the “Five pieces for Guitar” there are five other compositions included, that are transcriptions made by Benitez and approved by the composer himself. Being performed on solo guitar this album is very different from Adios Nonino I mentioned earlier. The weeping violin and heavy percussion can only be approximated by the guitar, thus the full ensemble of timbres and effects that is so central to Piazzolla compositions is lost. In its place there is an air of intimacy added to the works that is typical of the nylon-string acoustic guitar especially when played by master such as Benitez. I mean not only that by 1970 he won all the prestigious classical guitar contests in his country Uruguay, but after studying a year in Santiago de Compostela under Andrés Segovia In 1971 he won first prize at its annual international guitar competition, not to mention that in 1973, he won first prize in the 7th International Tárrega-contest in Benicásim, Spain. But aside his interest and success in the classical and baroque music Benitez breathes the Latin American music as second nature and exhibits an intimacy with Piazolla’s music one could seldom encounter. Benitez’ unique playing style along with his tonal clarity and balance are a joy to listen to. This is an outstanding album for fans of the classical guitar and tango music.